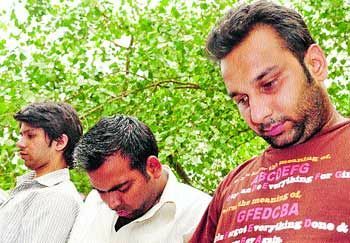 Days after the 100 per cent cut-off nightmare hit Delhi University, an admission racket has been busted, as three people have been arrested for selling fake caste certificates and helping at least 12 students get admission in top notch colleges. One of them is a student who scored 94 per cent and took the route to secure a seat at the prestigious SRCC. Due to the high cut offs in Delhi University this year, dozens of students including those who scored high marks, have had difficulty in getting admission. The group behind this racket, which has allegedly been in operation since 2008, cashed in on that desperation charging as much as Rs 5 lakh per student, to procure fake caste certificates for them to get them admission. The OBC cut-off percentage in the first list in top DU colleges for B(Com) and economics ranged from 92 per cent to 98 per cent and in the second list from 91 per cent to 96 per cent. DCP Ashok Chand said, "They made one OBC certificate, the rest were all Schedule Caste candidates' certificates." The accused, all in their 20's, including two former B(Com) students and a Merchant Navy officer had started an educational consultancy firm. When students approached them, they were promised a no hassle admission process for a price tag of Rs 3-5 lakh. According to the police, the mastermind Himanshu Gupta was arrested from outside Hansraj College in the Capital when he had gone to get a girl admitted. Twelve admission forms, fake caste certificates and Rs 5 lakh have been recovered from them. These students face a bleak future and their parents too will face police action. According to the inter-state cell of crime branch, led by ACP Rajender Bakshi, several other admissions in the OBC and SC quota in the past 10 days are being scrutinised. ``We are questioning a number of people, including parents of the students who were all admitted after the first list came out. A couple of teachers from prominent schools and tutorial houses of south Delhi are being investigated,'' said DCP (crime) Ashok Chand. While students with 71-78 per cent scores have taken this route, the case of a student who secured 94.25 per cent stands out. She was sure of getting her dream seat in B.Com (Hons) at SRCC but the first list dashed her hopes. She needed a minimum of 96 per cent. So, she produced a fake OBC certificate and got admission. A crucial role in this case and the other ones was played by Ketan, who is a data entry operator on contract at the Hauz Khas tehsildar's office.